I have to admit I have never been glamping.... but that is all about to change. I'm going glamping with Feather Down Farms very soon. 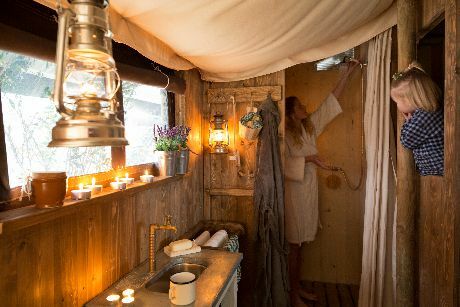 What is this glamping business all about you may ask? Well It's about supreme luxury in an outdoor living setting. I used to go camping every year as a child, as we couldn't afford to stay in a hotel. However camping, the old fashioned way, in a basic 4 person tent, without mod cons isn't the most comfortable of experiences. I always remember waking up on a hard floor as the blow-up mattress had a puncture and peeing in a bucket as the toilets were too far away! Cooking on a little one person gas stove was also an experience when you are making a meal for everyone. So it was with a tiny bit of trepidation that I was invited to review Feather Down Farms glamping holidays. 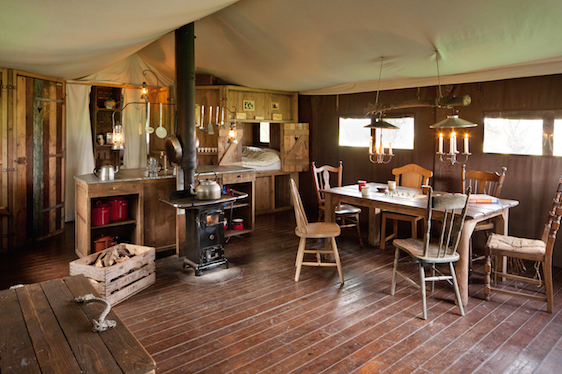 Feather Down Farms offer glamping holidays in a luxurious environment not traditionally associated with camping. Perfect for families but also couples, it really allows you to experience outdoor living but with comfort. There is no tent to set up with glamping holidays from Feather Down Farm, it is already set up for you. Everything is spacious and comfortable - from the proper beds to flushing toilets, there is no 'roughing it' here, even the floors are wooden. Some of the more luxurious tents even have a hot tub. I mean how fabulous is the interior of the tent above, I actually went WOW when I saw it? There is no electricity in a Feather Down tent but that is part of the charm. Being able to chat, spend quality time together, even play a game or two, without the distractions of the TV and technology will be a worthwhile experience I am sure. Sitting by the wood burning stove in the glow of the candle light could even lead to a romantic moment or two! Feather Down Farms have many sites around the UK and also some abroad and on this occasion, we will be staying at Cwmberach Uchaf farm, in the Brecon Beacons national park. Set in the Amman Valley, this farm is in an idyllic setting in the Black Mountains. On every Feather Down Farm holiday, you are shown around the farm by the owners. 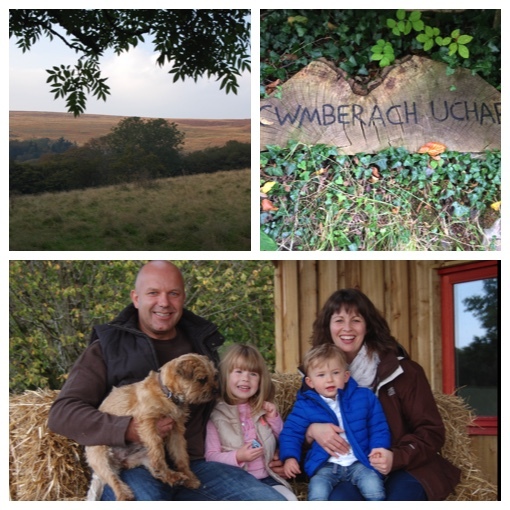 Mark and Sarah who own Cwmberach Uchaf farm look so delightful, I bet they will be really great hosts. On Cwmberach Uchaf farm there is a range of animals to meet, from unusual breeds of sheep to goats and in the spring lambs and piglets. What a fantastic experience for everyone, especially little ones! I can totally understand why Mumsnet have voted Feather Down Farms UK's best for camping, two years in a row. There is a farm shop on site at every farm with an honesty shop, and I can't wait to also cook some of the lovely free range eggs taken straight from the chicken's coup. I am looking forward to spending time at Cwmberach Uchaf farm, exploring nearby Llandeilo visiting Carreg Cennen castle and glamping under the stars of the Brecon Beacon national park. It will be an experience, and one I think I will remember for a very long time. Keep your eye peeled for my review in July. Tell me have you ever been glamping? What do you think of the luxurious facilities at Feather Down Farms? That is a tent Zoe! All the farms look amazing Hannah. They all have to come up to a high standard. I've never been to this area, other than driving through the Brecon Beacons. This looks amazing! And my experiences of camping with the blow up mattress and hard floor reality, camping stove and wee bucket are ALL the same. I am SO not a camping person! This looks like i could cope though. All i need is a comfy bed! Excited to see your pics! This looks absolutely incredible!!!! Can I come with you? You maybe able to fit in my suitcase! The last time we went camping I ended up ill with food poisoning and still have vivid memories on unzipping that tent and running to the portaloos, it really turned me off! I'm pretty sure that even I could get over my phobia for this! Oh dear Leanne. I am sure this experience will change your mind about life outdoors. It does look awesome, doesn't it? I've heard such good things about this place and it looks beautiful, I'm sure you will have an amazing time. We've been glamping once before and we'd love to go again. We really enjoyed unplugging from modern life for a few days. It looks amazing but I have to admit I neither camp nor glamp, my caravan is about as close to nature as we come. Maybe I can convert you to glamping, you will have to read my review when it's up. I really want to stay here. It looks amazing! I would love to try Glamping! It looks so fun! That's good to know that you have friends that have used this company. I will report back!